Glen West 2013 perfectly blended creativity and community with work and worship. The tag line for Image Journal proclaims: Art, Faith, Mystery. At Glen West, those theoretical concepts became experiential realities. The high desert plateau setting of Santa Fe was new to me and played a crucial role in the entire experience. If I were talking about a novel, I’d say that setting became a character in the narrative. He added, “Nature itself communicates the hidden attributes of God.” He encouraged us to observe nature by looking and listening. Receptive observation helps us write true descriptions that convey the Creator. 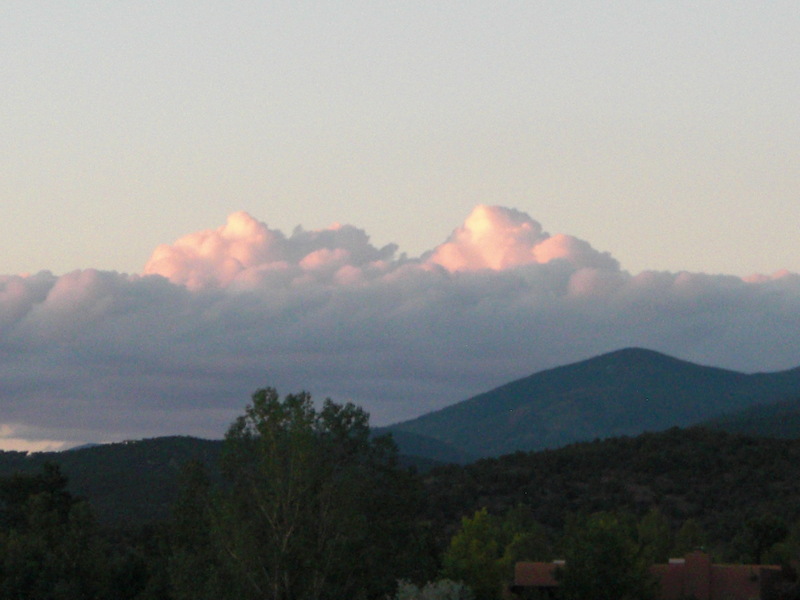 Surrounded by layered blue mountains and green-dotted brown hills, surveying majestic clouds in clear sky, and breathing Santa Fe’s rare air, I sensed the supernatural. Never before have I felt so intensely and consistently in the presence of God. I rested and gloried in the Creator, his creation, and his great gift of creativity. May we always see, and be in awe, of His creative glory and grace wherever we are ~ in Nature and Word.